This week's paddock activities have been dominated by the ALS Ice Bucket Challenge. Just like the rest of the world, people have been showering themselves with freezing cold water in the name of charity, and some of them have picked up points for it below. There are also points for sharing poignant photos, for wearing the wrong colour, and for singing the theme tune (not writing it). As always, your suggestions are super important to me. Please do keep them coming, as the second half of the season really gathers steam. Leave any you spot in the comments below or via Twitter. +2 Fernando Alonso: Having an unusual race with Kimi in Spa, with Shell's eco-marathon vehicles. An odd-looking bunch! +2 Kimi Räikkönen: Having an unusual race with Alonso in Spa, with Shell's eco-marathon vehicles. An odd-looking bunch! +2 Kamui Kobayashi: Sharing a melancholic image, sitting on a bench all alone in Paris while someone else was racing in his car. +2 Lewis Hamilton: A couple of bonus points for the outtakes of his James Corden in-car interview. Fresh Prince of Bel-Air! +3 Daniel Ricciardo: Excellent ice-bucket challenge, three full buckets worth and still smiling. -1 André Lotterer: Wearing red shoes with his green Caterham suit. Like red wing mirrors but for feet! +2 Felipe Massa: Attempting to force Rob Smedley to take part in the ice bucket challenge, which doesn't really go down too well! -2 Lewis Hamilton: Didn't quite feel like Lewis had a handle on the whole ice bucket thing. No words in the video so no nominees, and then named four people on Twitter later. +2 Fernando Alonso: A good ice bucket challenge, he even manages to catch some cubes on the way. +2 Felipe Massa: Love Felipe just scampering off after being doused in ice - no top on or anything! +1 Nico Hülkenberg: Also having fun with the ice bucket challenge. +2 Susie Wolff: Fun selfie face - from a variety of angles. The taking of and the end result. 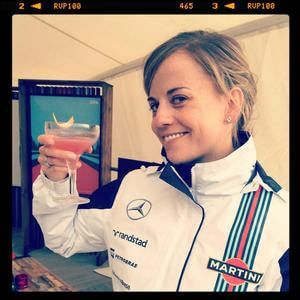 +2 Susie Wolff: Excellent cocktail-making skills, and also very on message with an Eau Rouge. +5 Jenson Button: Being brave enough to nominate Ron Dennis for the ice bucket challenge. RON DENNIS! +1 Nico Rosberg: An awful lot of water goes over Nico's head for his bucket of ice challenge.